Love playing chess? Want to expand your chess skill? 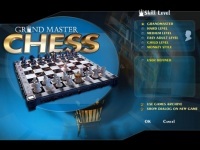 Grand Master Chess 3 will help you improve your chess skill by practicing chess against computer using variuos difficulty levels from very basic to the grand master level. You can perform customized friendly match or play against computer in solo mode. You can also play your own favorite music while playing chess. The graphics details are clear and supporting 3 dimensional layout. But if you are stuck on 3D, just with a click, you can switch the layout into 2D board. No matter you are a beginner or even a skilled chess player, Grand Master Chess 3 could be sufficient to enjoy. Decide whether to play white or black, then choose the skill level. There are six levels available: Monkey level, child level, easy level, medium level, hard lebel, and Grand Master level. Uniquely, you can set a user defined match to solve specific chess problem. Play chess with increasing levels of difficulty and thousands of tactical combinations. Guess opponent's fleet location and destroy them all.